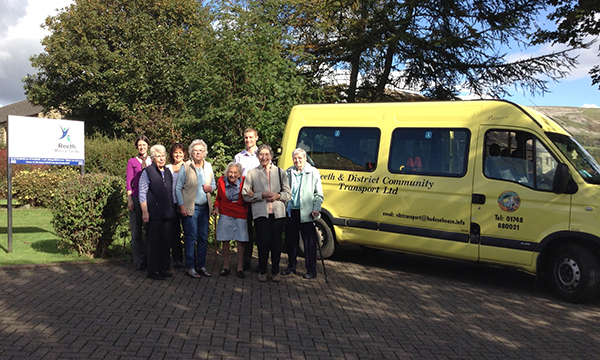 An innovative practice project is using a transport service to reduce social isolation for its most vulnerable patients. Reeth Medical Centre covers the area of Swaledale and Arkengarthdale in North Yorkshire and has a patient population of 1,600. Around 10% of the practice’s patients are over 75, and there is a higher than national average prevalence of chronic disease. A practice review of district nursing home visits over a 12-month period found that 86% of calls were generated due to patients not having access to transport to attend the practice for routine checks, tests and vaccinations. The practice came up with the idea of offering a free patient transport service to enable patients to attend the practice and get out in the community. Working together with South Tees NHS Foundation Trust, Hambleton, Richmondshire and Whitby Clinical Commissioning Group, and Reeth and District Community Transport (a charitable transport initiative) – the free patient transport service launched in October 2015. The practice uses an existing wheelchair-friendly community bus. The practice’s only expenditure was the purchase of a wheelchair for the transport bus to use. The district nursing team is based at The Friary Clinic in Richmond and cover nine GP practices. The village of Reeth is situated around 11 miles west from their location. 'We go up to the Yokrshire Dales twice a week as we have a regular caseload of housebound patients and it takes around 20 minutes to get from our base to the practice in Reeth,' says South Tees NHS Foundation Trust district nursing sister, Penny Hutchinson. Many of the practice’s patients live a 30-minute drive from the practice so home visits can be time-consuming for the nurses. 'Part of the route to Reeth also involves travelling along winding country roads,' says Ms Hutchinson. 'It is not too uncommon for us to be held up by becoming stuck behind a tractor, for example. We have one patient who lives a 40-minute drive from our base and the home visit is a short one, it takes us about ten minutes. Patients using the transport service typically see the practice nurse. They can use the bus to see the GP, attend physiotherapy or podiatry appointments or collect medicines. They may also be seen by the practice’s designated district nurse. This is a unique type of arrangement with the practice due to its remote location. The district nurse holds a two-hour clinic at the practice twice a month. One example of how nurses have shared clinical skills is that the district nurse has learned how to carry out a diabetes check from the practice nurse. 'We have a special relationship with the practice,' says Penny Hutchinson. 'If we are struggling to get to one of our housebound patients due to bad weather, for example, we can call the practice to let them know that we are having difficulties reaching a patient. They will then try to help us by seeing if the GP could visit the patient instead. 'We are a small, single-handed GP practice and it keeps the district nurse in touch with practice nursing,' says Reeth Medical Centre’s managing partner Marie Brookes. The community bus is used to provide a weekly medicine delivery to seven of the practice’s most vulnerable patients. It is resulting in improved compliance and concordance, says Ms Brookes. After the first year of the patient transport service, there was a 42% reduction in home visits. Latest figures from the practice covering the period from September 2016 to end of February 2017 reveal that 43 referrals for the district nursing team have been dealt with by the community transport service. This represents a travel time saving of around 64.5 hours for the team. It is hoped that there may be interest in offering the community transport service to patients who are registered at other practices in the Reeth Medical Centre area. This would enable the district nursing team to see those patients at the practice and may help to further reduce travel time to and from their Richmond base. 'The main benefit of this service for our patients is the social aspect,' says Ms Brookes. Patients can use the bus to access other areas of support in the community following their trip to the practice. This might include attending luncheon clubs or popping to the post office or local shops. The practice can also make arrangements to coincide clinics and patient appointments with sheltered housing events such as bingo and afternoon tea. In addition, the practice organises its own social events for patients. 'We offer a winter flu clinic and run a bus service to bring patients to the practice,' says Ms Brookes. The clinic provides around 250 flu vaccinations. Once the clinic is over, patients are treated to hot drinks, cakes, a tombola and a raffle. 'It is a good way for patients to catch up with one another,' she adds.